A modern jacket offering wearable versatility in the broadest range of temperatures and environments. We updated our favorite, classic quilted jacket with dynamic stretch and an industry-leading quick-dry and packable insulation to keep you comfortable, warm and dry in any condition. 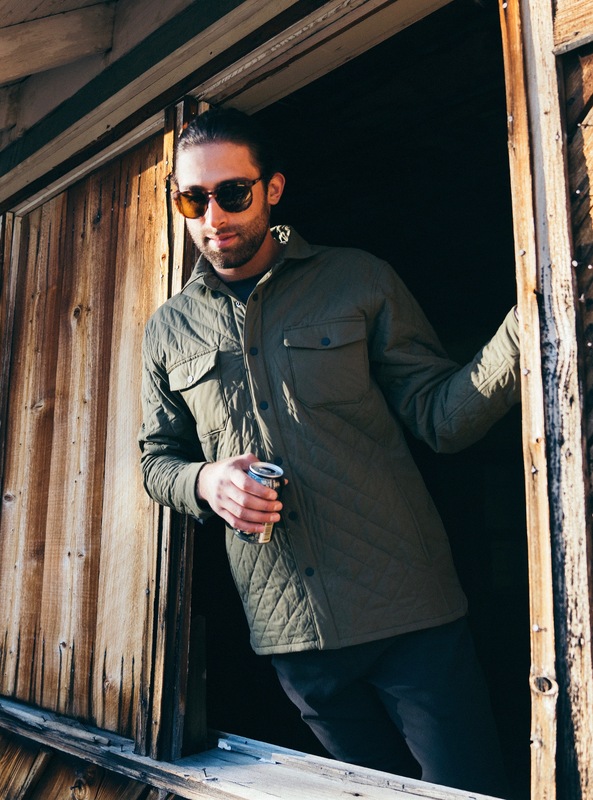 The modern cut provides freedom of movement and a flattering fit to make the AirLoft Quilted Jacket a staple you can wear alone or use as an insulation layer from Fall through Spring. AirLoft™ uses Toray’s new 60g 3DeFX+® hollow-core, 4-way stretch insulation for ultimate performance in the widest range of situations. Its continuous fiber technology is loftier and warmer than any other synthetic insulation option, and ideal when the need for warmth, breathability, and flexibility intersect. This breakthrough technology is paired with a new self-cleaning, 4-way stretch, Primeflex® exterior fabric with a C6 DWR for dirt, stain, and weather resistance optimized for cool-weather activity. This high-performance jacket is finished with double chest pockets to keep contents in place and a hidden interior media pocket that fits your phone perfectly. Double hand pockets keep hands warm and act as a packable stuff sack. Sleeves are articulated to 75 degrees for added mobility and range of motion. Quilting and a tailored cut give this staple a classic look to complement its technical performance. Do you have more questions about style or fit? Check out this garment's specific size details in the size tab below or give us a shout at help@westernrise.com. We are here to help! Really solid jacket. Very soft and light, not too hot but still provides nice protection from the elements. Seems pretty stylish too - good pickup. I got this from a retailer mid last year. I love the design and that great feeling wearing it. Pretty wind resistant and waterproof, it is light and package as well. Love it! One slight drawback, if you are wearing hardwearing pants or belt and carrying a full rucksack, it may wear the inner soft material. Lesson learned, don't tuck in your shirt! This is the jacket I've been looking for my entire life. Soft, stretchy, and stylish yet highly technical, I haven't taken it off except to shower. Goes easily from the office to the city to the mountains to lounging at home, it's as good as it gets! All the features of a Pat****ia jacket but way better looking. In a word, Perfect. Living in Iowa for a lifetime so far, i’ve acquired plenty of North Face coats, and other fleece jackets. This is a welcomed difference to that world. Form fitting but not too much so (i’m 5’10”, 183, and the Large fits perfectly over a t shirt, wool zip-up. It’s compact with perfect length in arms, and back. Stylish, and simple. Just was looking to wear something that had nice insulation, but wore like a nice flannel and no added unnecessary bulk. It’s also a nice departure from the over purchased lateral tubed-looking coats that have dominated for several years...enough of them already. Clean lines, subtle quilting diagonal pattern throughout the coat. coat. Compliments whenever I wear it. Feel like running an errand does not need to be covering your upper body with a blanket. Won’t work for a 4 hour chilly football game, but 30-60 minutes at 25+ degrees, and longer if a low medium weight wool long sleeve shirt. Don’t take my word for it. Order it to test it. Great customer service! AirLoft - AirLoft opens the door for an entirely new type of breathable insulation by sandwiching Toray’s new, industry-leading 3DeFX+® active insulation between an ultra lightweight, durable, 4-way stretch fabric and an inner light 4-way stretch, wicking, breathable Polyester that is soft and light against the skin. The Toray 3DeFX+® Synthetic insulation is the first of it’s kind, creating 4 types of continuous coil-shaped spiraling fibers that are loftier, more breathable, and stretch more than any synthetic insulation on the market. The 3DeFX+® is built to breathe freely, move with the body, dry quickly, and keep the body warm even in the wettest conditions. At 60gsm through the body and 40gsm through the arms, the thermo-buffering hollow-core yarns trap air to retain unmatched warmth while giving full freedom of movement. Quilted to improve shape and durability, AirLoft is ready for the broadest temperature ranges and unrestricted movement. The AirLoft Quilted Jacket is designed and sized for a flattering and slimming, yet comfortable fit. Please refer to the size chart for specific garment measurements by size. Size chart refers to garment NOT body measurements. If you have any questions about sizing or fit, please send us a note at help@westernrise.com. The water resistance in this piece allows it to absorb less odor and staining than a standard shirt jacket. Thus, the AirLoft can and should be washed less frequently. When necessary wash with like colors with mild detergent cold. Line dry. Do not use bleach or fabric softener as these will damage coloring and water resistance. Over time the water resistance may appear to wear down. It can be reactivated with a quick tumble in the dryer on low or by applying a tech wash.
Avoid oils and grease as they will permanently damage the water repellent treatment and possibly stain the piece.